The first battery operated alarm clocks were made by the Warren Clock Company in Ashland, Massachusetts back in 1912? Back then, disposable batteries wore out quickly, so the new clocks were not a big hit and took a back seat to winding clocks. Now that batteries last much longer, battery operated clocks can be found in most homes and travelers' suitcases. Without cords, battery operated alarm clocks makes an attractive alternative timepiece for any room in a home or office. They can be easily moved when a room is redecorated. They can fit in purses, briefcases, backpacks and glove compartments so you'll always know the time and have an alarm to keep you moving. Battery operated clocks also make a great alternative for people who cannot wear watches due to medical reasons. They also are not magnets for thieves like expensive wristwatches can be. You'll never have to worry about a wristband wearing out with a travel-sized battery operated clock. Battery operated alarm clocks come in a wide variety of colors and designs so that they can harmoniously blend in with any décor. 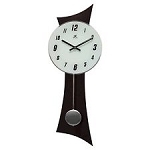 Choose from classic designs of dial-faced twin-bell alarm clocks to the sleek modern digital faced models. Pick from shapes round, square or something in between. Whimsical takes on the usual alarm clock includes a picture of a cow under twin cow bells. 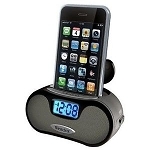 We have a great selection of battery alarm clocks. No cords included with these clocks which keeps everything at the nightstand clean and decorative.